SKYWARN, a program of the National Weather Service, includes thousands of volunteer storm spotters who serve as a first line of defense against severe weather. Amateur Radio operators bring great resources to storm spotting, including an established communications system that can function in an emergency, a pool of volunteers willing to be trained, a history of public service, and technologies no other group has. 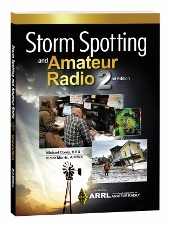 Fully updated, the second edition of Storm Spotting and Amateur Radio is a valuable resource for the Amateur Radio operator who volunteers as a trained storm spotter. This book includes information on resources, training, equipment, safety, storm spotter activation procedures, reportable weather criteria, developing a local storm spotter manual, and the experiences of storm spotters from around the country. It also provides some meteorological information about severe weather such as hurricanes, tornadoes, thunderstorms, winter weather, floods, dust storms, and nor’easters. A comprehensive Appendix with information on weather-related publications and websites, a sample SKYWARN operations manual, a sample after-action report, and more. Storm Spotting and Amateur Radio. Kindle Edition.